Today, I'm continuing my mini series about getting involved! Last week I talked about getting involved in high school and today I'm going to be giving my best tips for finding your place on campus. So if you're in college or college bound soon this post is for you! Most likely in the first few weeks of school starting, your college will have an activities fair. I highly recommend going to this and signing up for all the clubs that interest you. It's better to sign up for way too many and unsubscribe later than to miss out on a club. So if you think you may be at all interested then write down your email! This way you can find out when the first meeting is and what types of things they do so that you can decide if it is fitting for you. If the long list of clubs and activities is overwhelming a good place to start is with clubs related to your major or your interests. This is the perfect place to connect with people that are likely in the same classes as you as well as just share similar passions to you. Plus it may also give you some hands on experience in your area of interest. Greek life is not for everyone, but it is a wonderful way to connect with people who share similar values and ideas with you. My sorority has definitely helped me find a sense of belonging on campus. We are a part of every big campus event and activity and being a part of it has just made me feel like I fit. But even if you choose not to go greek, you can often find a very similar community with sports teams or religious groups. The biggest key to feeling like you belong on campus is to simply go to campus events! Some of the best memories I have of my freshman year are the fun random events my school put on. Going to these events is a great way to have fun with existing friends but also meet new people. Plus it is so fun to be apart of campus traditions! Check out that club that's intriguing but so not you, do something that none of your friends want to do, and say yes when you might normally say no: all of these are great ways to push your limits and to explore your school! Sometimes the best things are things that you wouldn't normally do. College is your time to take chances and try new things, so embrace it! Whether you are at a big school or a small school, getting involved is what makes your college feel like a home. Put yourself out there and I promise you will find your spot on campus! The more I was involved the more fun I had and the more I felt like I belonged. 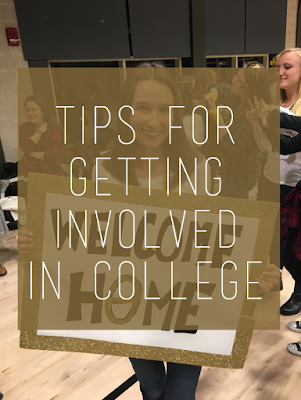 I hope this post was helpful, make sure you stay tuned next Monday for the final post of this series about getting involved outside of school!